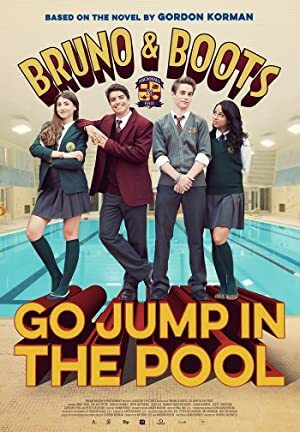 Bruno & Boots: Go Jump in the Pool (2016) – What's New on Netflix Canada Today! Bruno Walton and Melvin “Boots” O’Neal are the most infamous troublemakers at MacDonald Hall – a supposedly prestigious school for boys. Bruno, the brains behind the operation, has managed without fail to convince Boots to tag along on his countless prank operations whether it includes stealing a rival school’s mascot, switching the school’s flag or invading Miss Scrimmage’s Academy for Girls Education and Awakening across the road. Despite their ongoing pranks, Bruno and Boots LOVE their school and are willing to do anything to protect it. After a dismal defeat at the hands of their York Academy rivals at the semi-annual swim meet, Bruno uncovers that MacDonald Hall is perilously close to losing several top students to York (including his best pal Boots) thanks to MacDonald Hall’s less than impressive sports facilities. Determined to save their swim program and keep his friends at MacDonald Hall, Bruno goes on a fundraising warpath to build their own pool. Through rummage sales, nationally televised bake-offs and other ill-advised (borderline illegal) schemes, the Macdonald Hall boys raise a good chunk of cash. But with the final swim meet of the season close at hand and only half the funds raised, Bruno must take drastic action to keep Boots from becoming a dreaded York “turkey” – a fate worse than any detention Headmaster William “The Fish” Sturgeon can dole out.